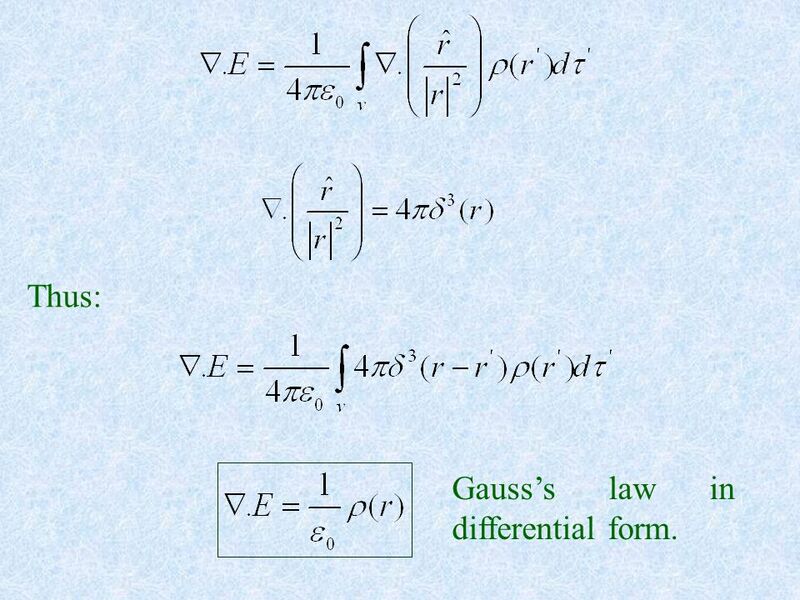 2 Thus: Gauss’s law in differential form. 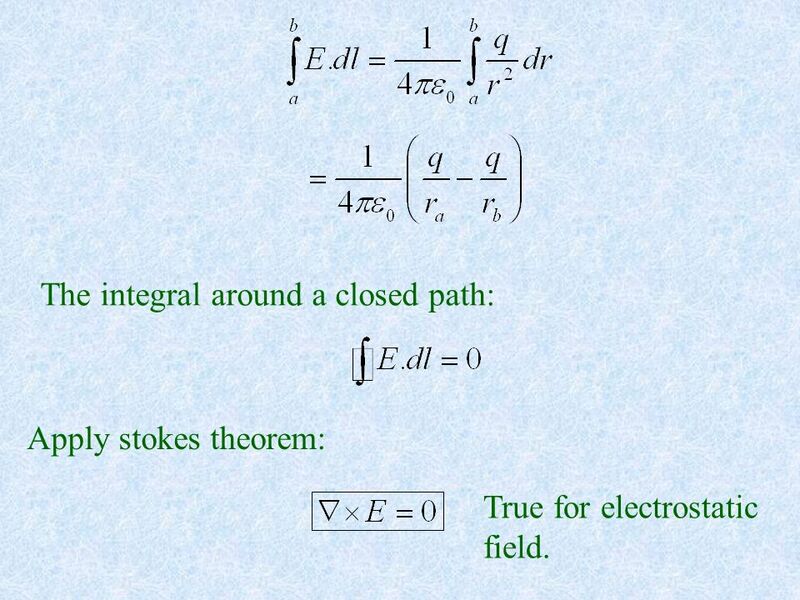 Apply stokes theorem: True for electrostatic field. The absence of closed lines is the property of vector field whose curl is zero. 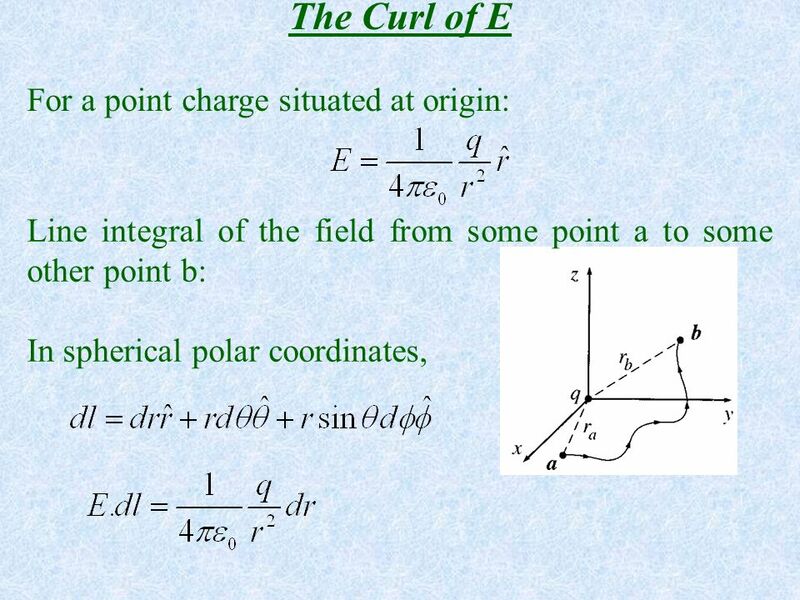 E is such a vector whose curl is zero. Using this special kind of it’s property we can reduce a vector problem: using V, we can get E very easily. 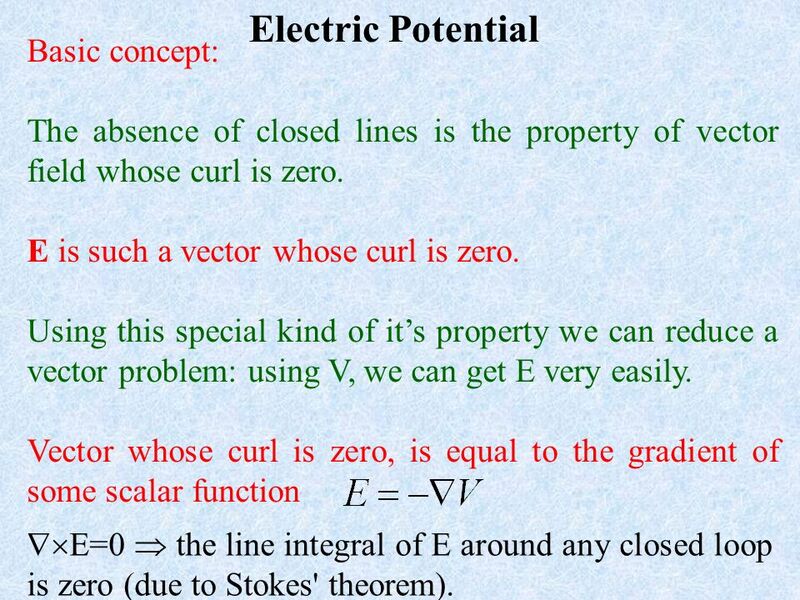 Vector whose curl is zero, is equal to the gradient of some scalar function E=0  the line integral of E around any closed loop is zero (due to Stokes' theorem). 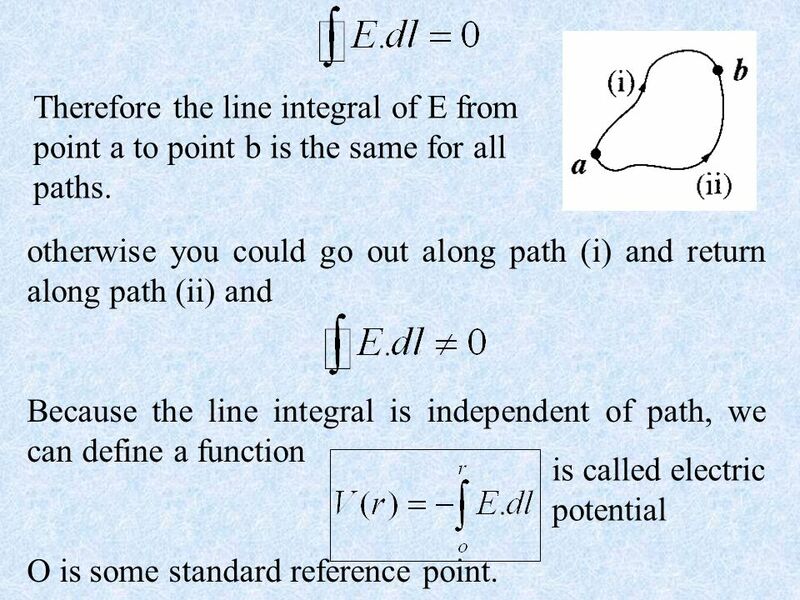 7 Therefore the line integral of E from point a to point b is the same for all paths. 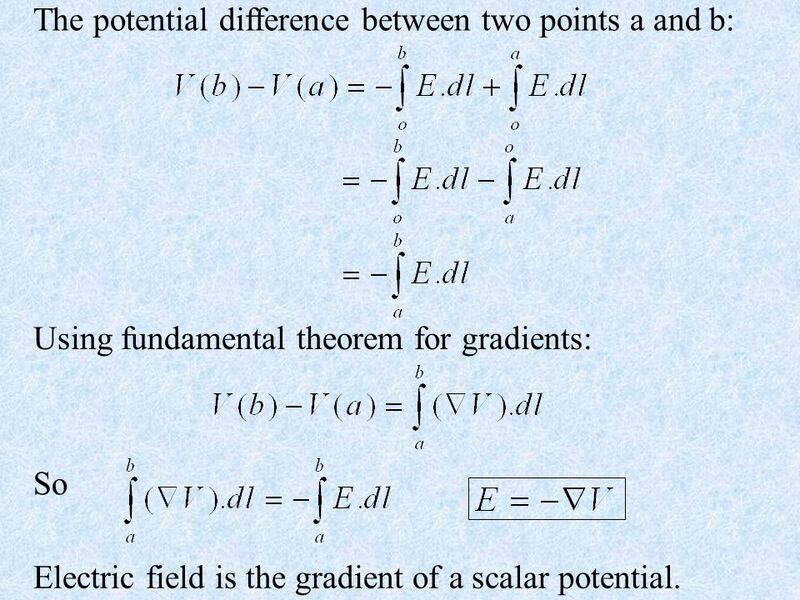 Using fundamental theorem for gradients: So Electric field is the gradient of a scalar potential. 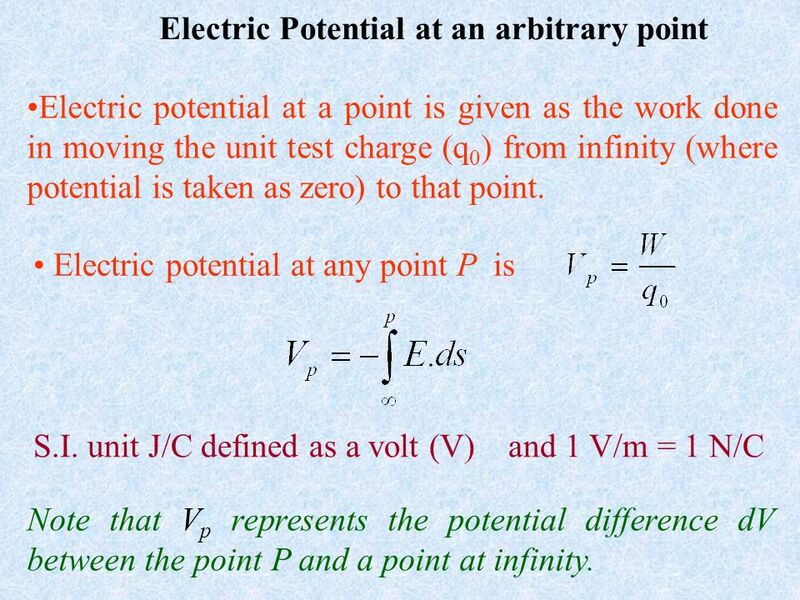 Electric potential at a point is given as the work done in moving the unit test charge (q0) from infinity (where potential is taken as zero) to that point. 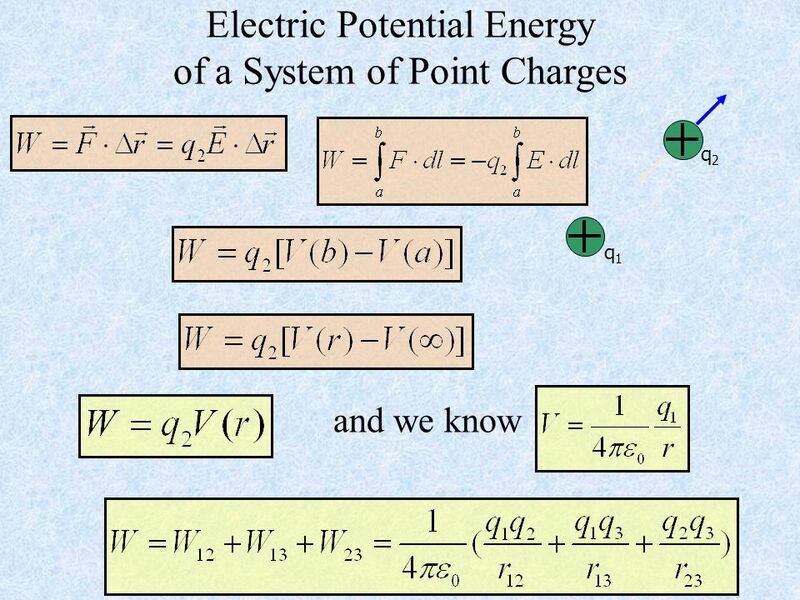 Electric potential at any point P is S.I. 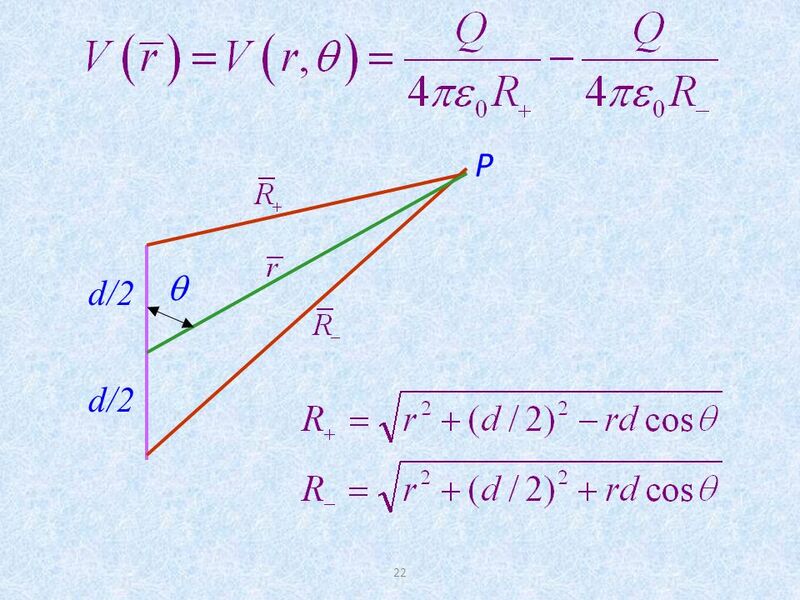 unit J/C defined as a volt (V) and 1 V/m = 1 N/C Note that Vp represents the potential difference dV between the point P and a point at infinity. 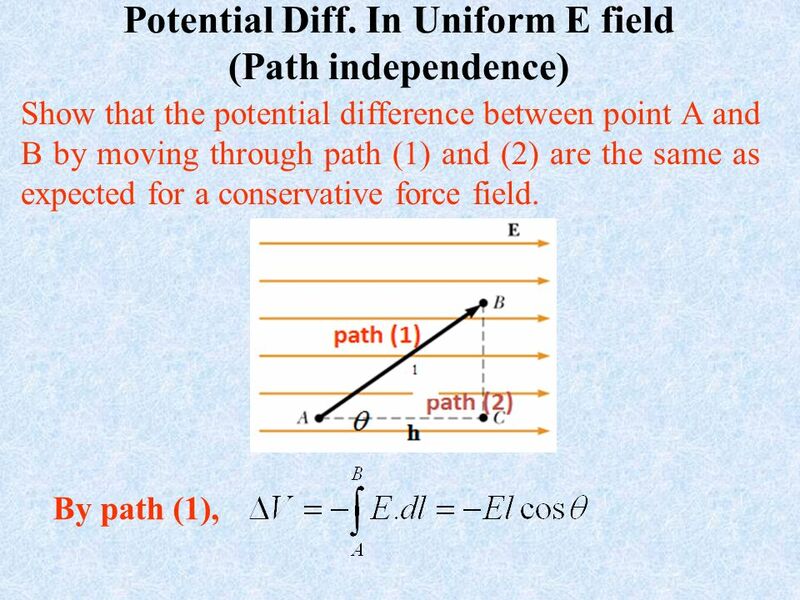 Example: Uniform field along –y axis (E parallel to dl) When the electric field E is directed downward, point B is at a lower electric potential than point A. 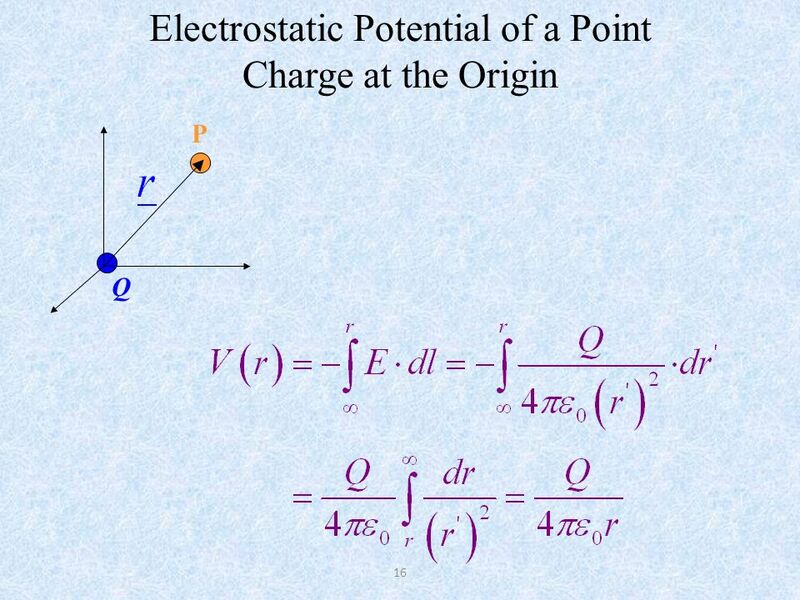 A positive test charge that moves from point A to point B loses electric potential energy. 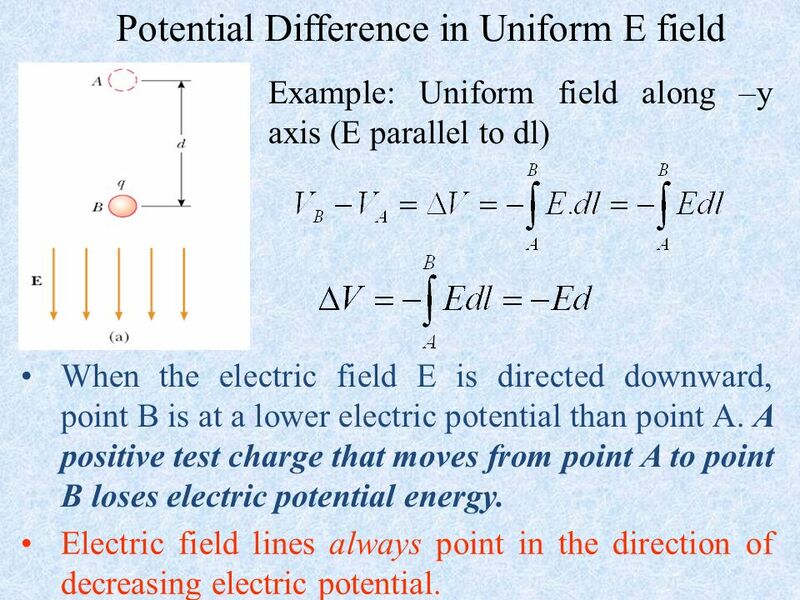 Electric field lines always point in the direction of decreasing electric potential. 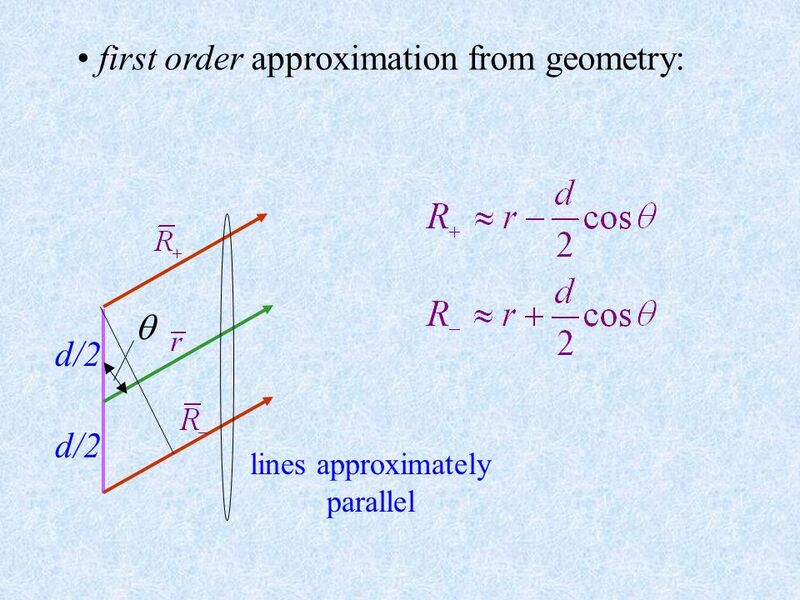 VC = VB ( same potential) In fact, points along this line has the same potential. We have an equipotential line. 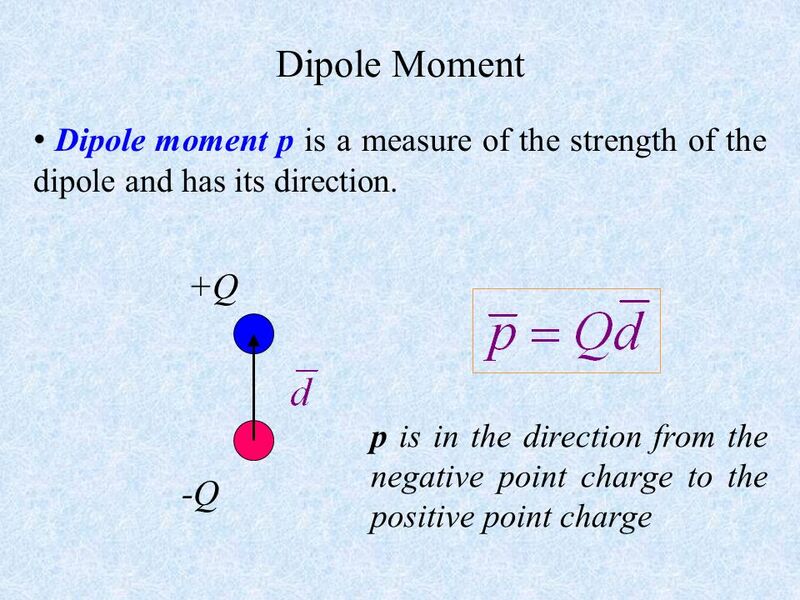 No work is done in moving a test charge between any two points on an equipotential surface. 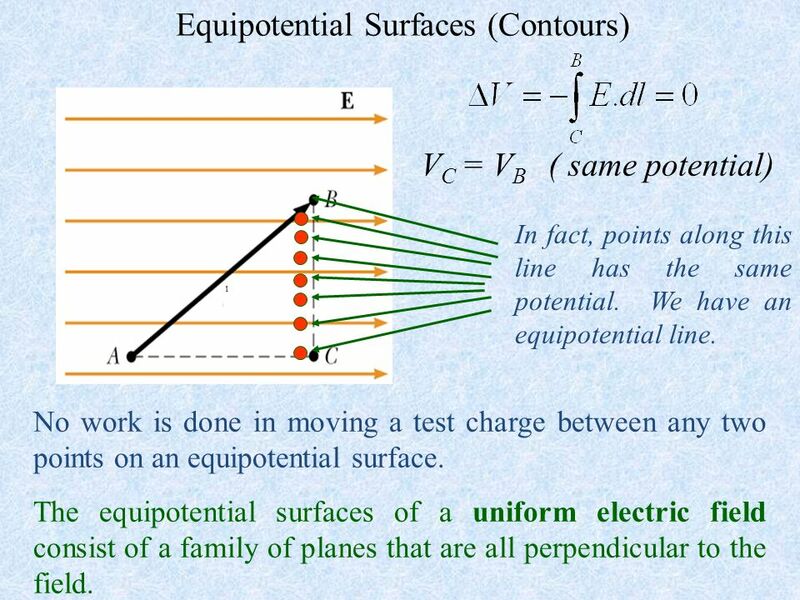 The equipotential surfaces of a uniform electric field consist of a family of planes that are all perpendicular to the field. 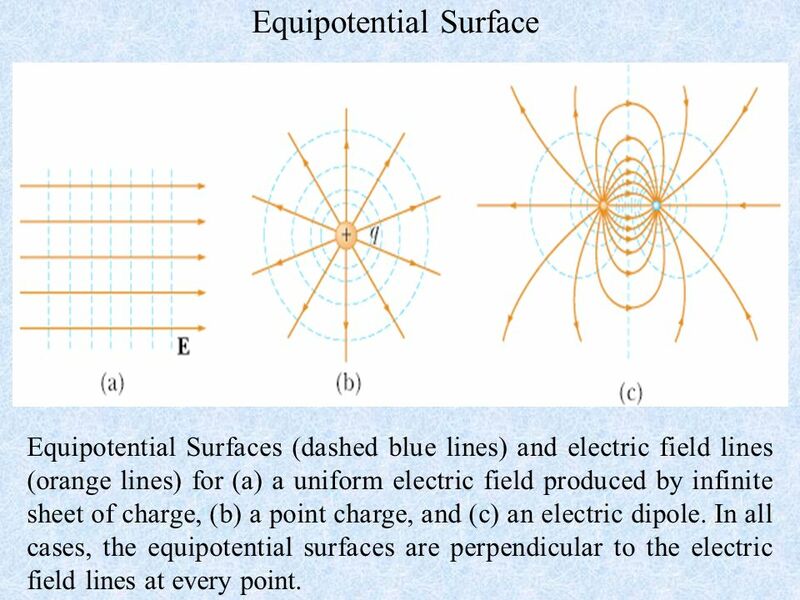 Equipotential Surfaces (dashed blue lines) and electric field lines (orange lines) for (a) a uniform electric field produced by infinite sheet of charge, (b) a point charge, and (c) an electric dipole. 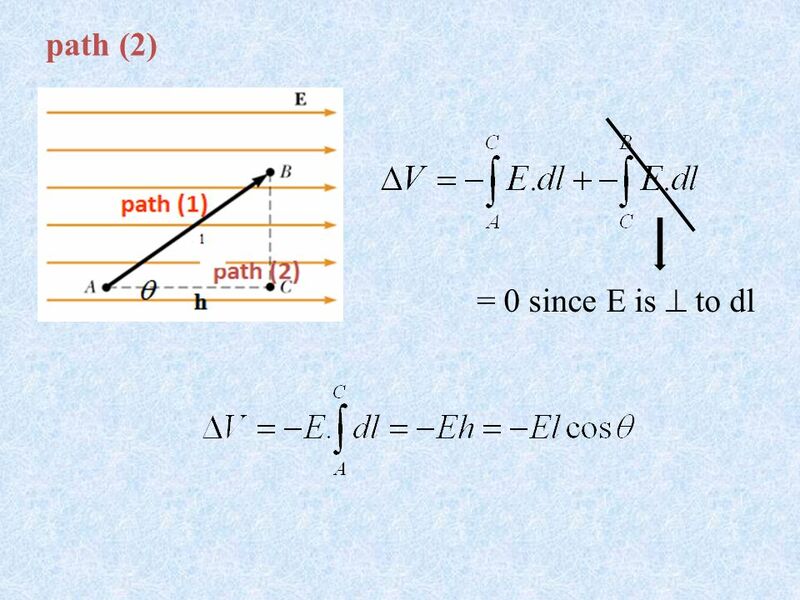 In all cases, the equipotential surfaces are perpendicular to the electric field lines at every point. 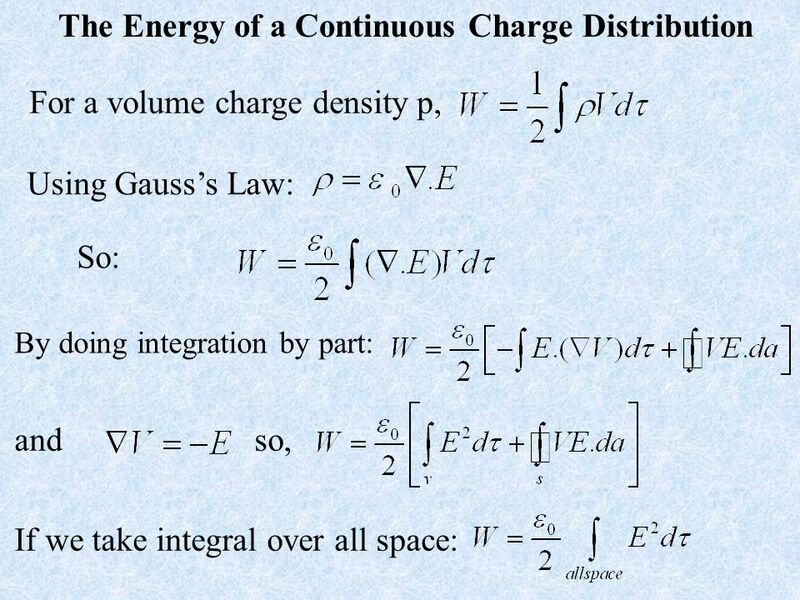 The fundamental equations for E: Gauss’s law then says that: This is known as Poisson’s equation. 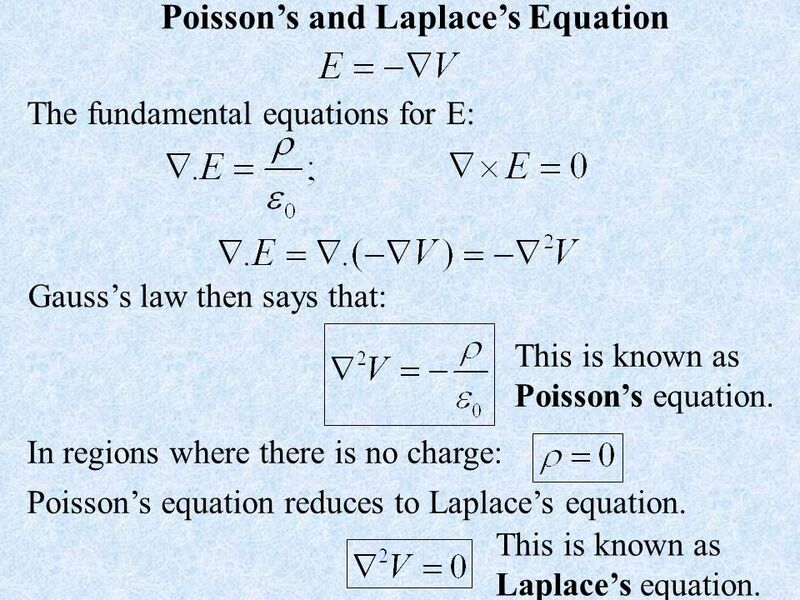 In regions where there is no charge: Poisson’s equation reduces to Laplace’s equation. 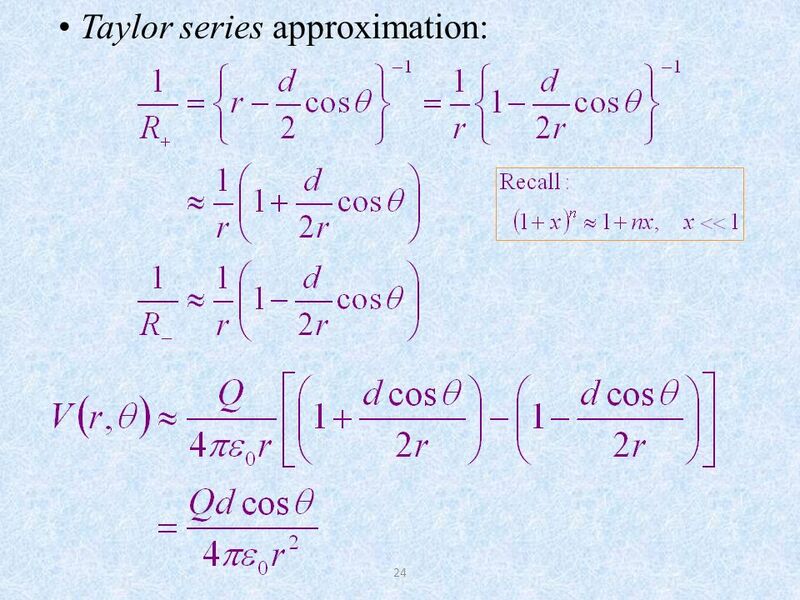 This is known as Laplace’s equation. 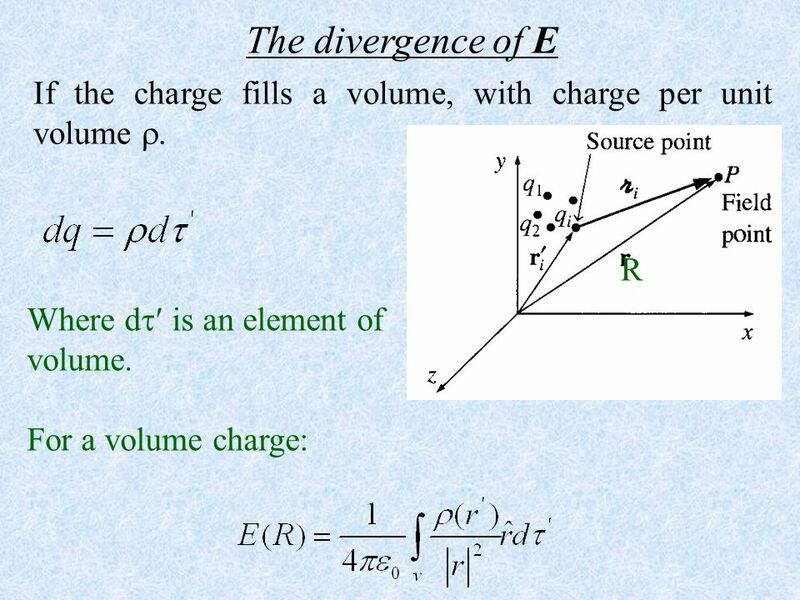 Download ppt "The divergence of E If the charge fills a volume, with charge per unit volume . R Where d is an element of volume. 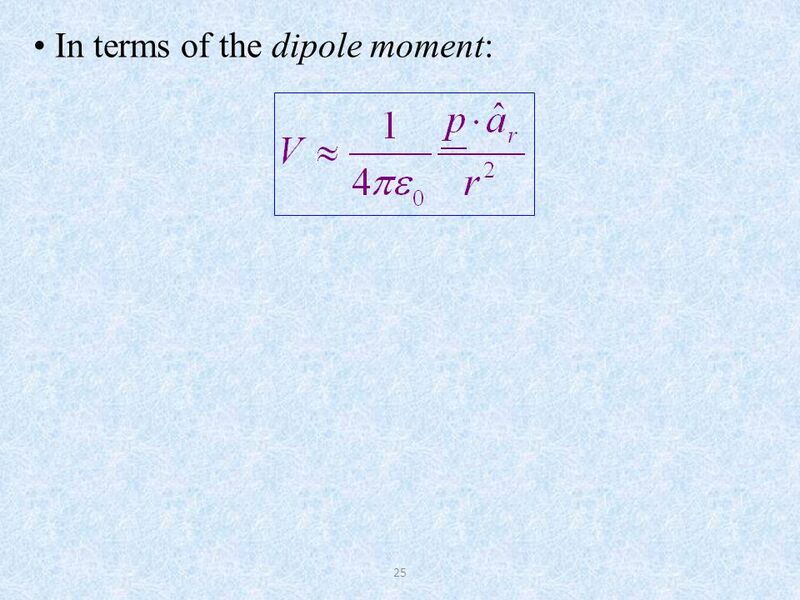 For a volume charge:"
Physics 2102 Gabriela González Physics 2102 Electric Potential. 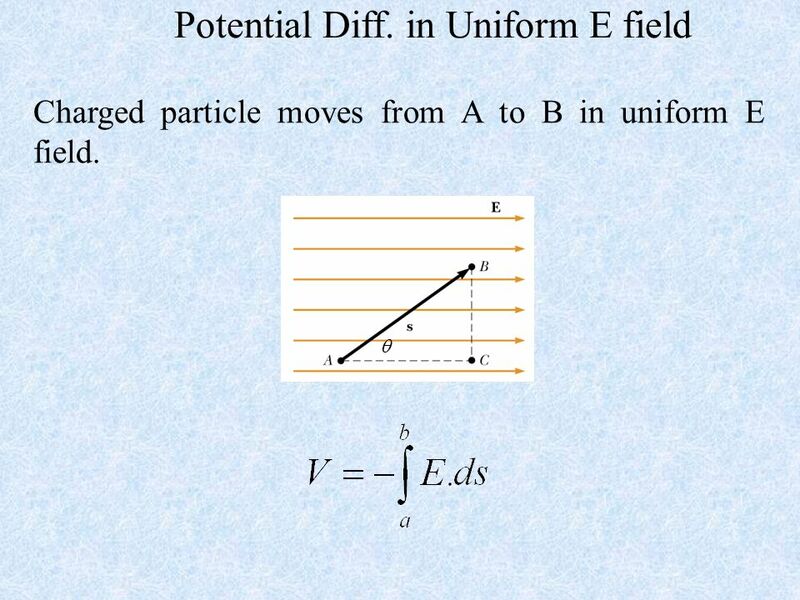 Chapter 2 Electrostatics 2.0 New Notations 2.1 The Electrostatic Field 2.2 Divergence and Curl of Electrostatic Field 2.3 Electric Potential 2.4 Work and. February 16, 2010 Potential Difference and Electric Potential. 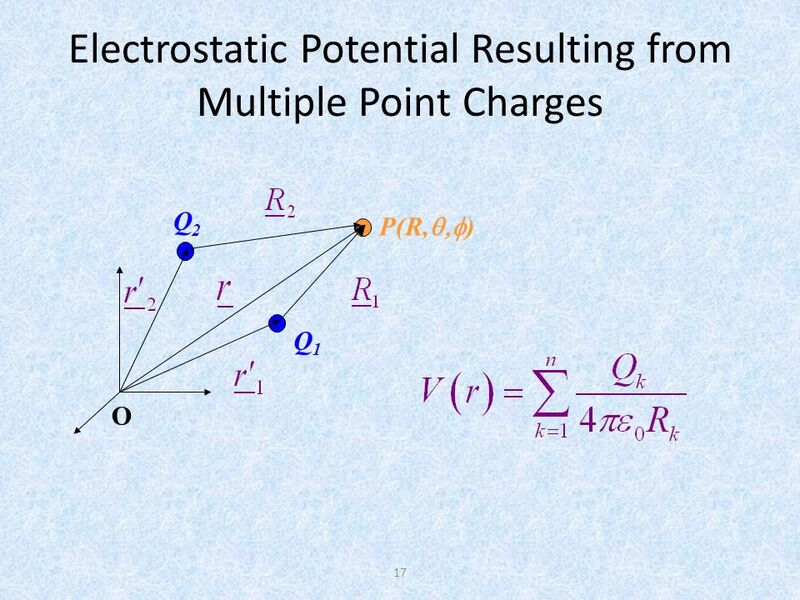 EEE340Lecture 081 Example 3-1 Determine the electric field intensity at P (-0.2, 0, -2.3) due to a point charge of +5 (nC) at Q (0.2,0.1,-2.5) Solution. 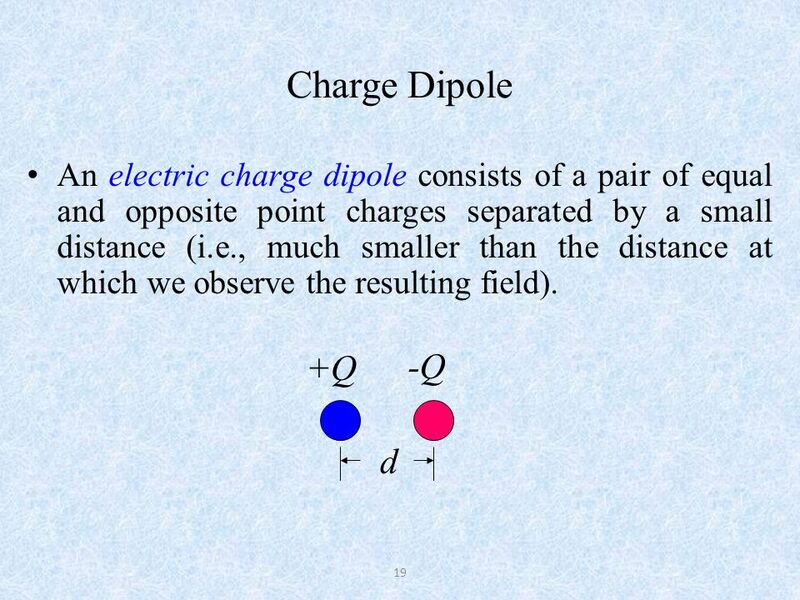 Electrostatics Electrostatics is the branch of electromagnetics dealing with the effects of electric charges at rest. The fundamental law of electrostatics. Magnetostatics Magnetostatics is the branch of electromagnetics dealing with the effects of electric charges in steady motion (i.e, steady current or DC). Physics 121: Electricity & Magnetism – Lecture 5 Electric Potential Dale E. Gary Wenda Cao NJIT Physics Department. 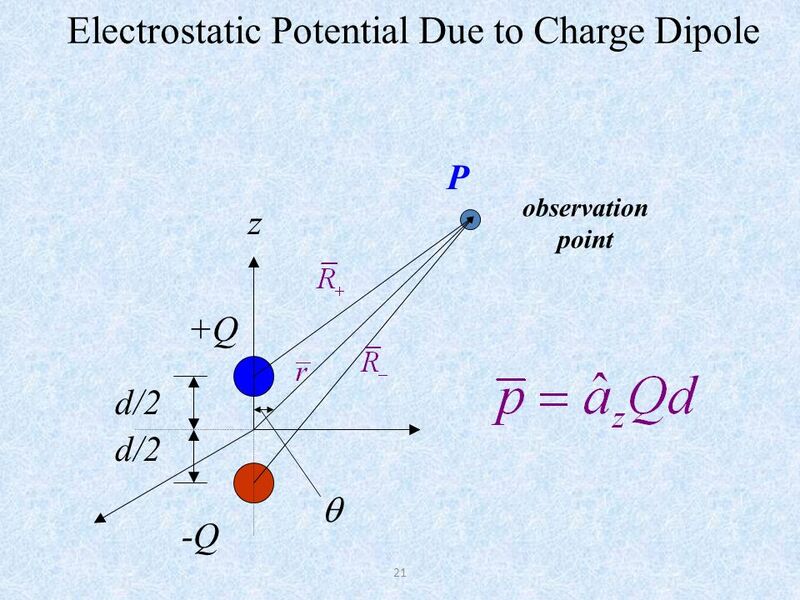 Lecture 6 Capacitance and Capacitors Electrostatic Potential Energy Prof. Viviana Vladutescu. 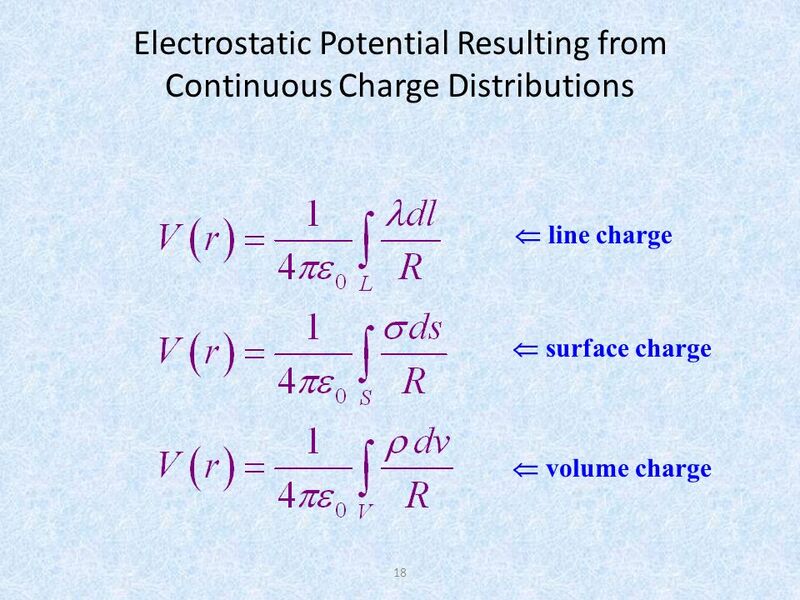 Lecture 3 Electrical Energy Chapter 16.1  16.5 Outline Potential Difference Electric Potential Equipotential Surface. 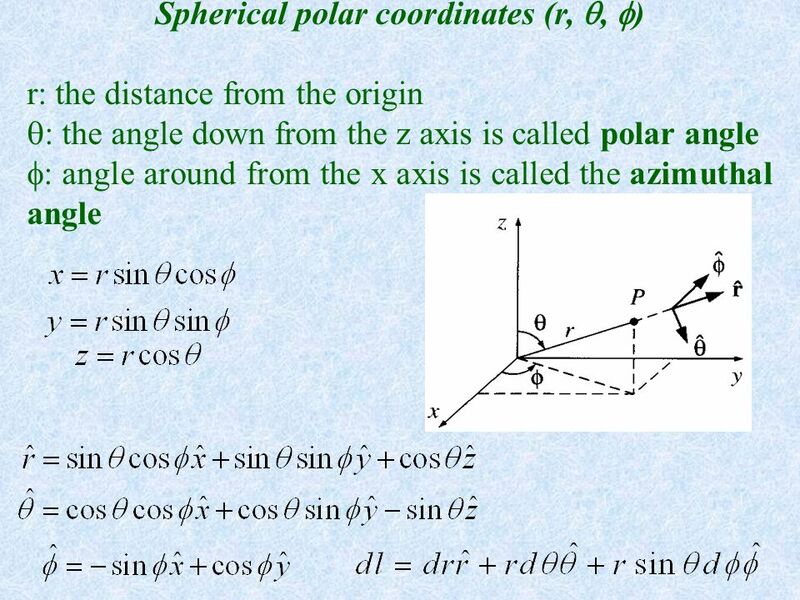 Outline  Uses of Gravity and Magnetic exploration  Concept of Potential Field  Conservative  Curl-free (irrotational)  Key equations and theorems.